I had the most wonderful Christmas - though I am spending it in the UK, away from my family in the US, I have spent it with my 'British family' - being my partner's lovely parents, sisters, cousins, grandparents, aunts & uncles, all of whom have made me feel so incredibly welcome. What was on my Christmas list this year? I could have asked for practical things like clothes, toiletries, cookware... nahh. I took this opportunity to clean out my Amazon book wishlist. Creating Original Hand-Knitted Lace by Margaret Stove - What a gem. I actually really like the anecdotes she includes in her writing, taking this journey with her as she converts some native New Zealand flora into lace. I can tell I'm going to really enjoy this book. Cornish Guernseys and Knit-Frocks by Mary Wright - This is a small book but extremely interesting and full of photographs. The photos are old, of course, but I would've liked to have seen more detail in dark areas (since nearly all the guernseys shown are in navy blue or slate grey) - I think that in at least some of the cases, this is a fault in the book printing, rather than the source photographs. 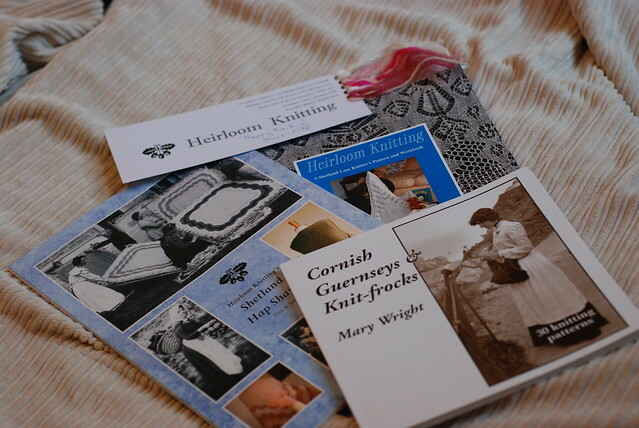 However it's an extremely interesting little book, with some traditional Cornish gansey stitch patterns included (made of knits & purls and some with cables - all both charted and written), and well worth adding to your collection. Heirloom Knitting by Sharon Miller- This is a formidable volume - a big, heavy book with nearly 300 generously sized pages. I look forward to giving this one a proper read, because I can see there's too much to just summarize it in a few minutes. There's history, technique, construction, design... Just about everything you need to knit Shetland lace. Plenty of charted stitch patterns and edgings with some explanatory text about each - where to use it, how to modify it, or other useful things to know. Shetland Hap Shawls Then and Now - Though a much smaller book than its neighbor Heirloom Knitting, it packs an impressive amount of information - dozens of beautiful photos, many pages of text as well as charts (both lace charts and stripe charts). I've been planning to make a hap-style shawl for myself, so I was especially pleased to receive this. Knitting in the Old Way - A very interesting book that I really need to delve into further. A range of ethnic designs, from arans to Cowichan sweaters to American folk motifs adapted for knitting. All about sweaters, but a good reference to have. Real Shetland Yarns - This isn't really a knitting book, per se, but I got it after reading Kate Davies' rave review on her blog. I haven't sunk my teeth into it quite yet but it does have some breathtaking photos in it. An even more special gift also arrived for me recently. I hold the belief that the best presents aren't the ones you ask for, but the ones you didn't even know you wanted. When someone knows you well enough to pick out something even better than you could yourself - those are very special gifts indeed. I was fortunate enough to receive such a gift this season. A little package from Edinburgh, from my most excellent friend Shobha. This is a ball of St Kilda Lace, a blend of Boreray and Soay wool - the Boreray undercoat being from the very special project to produce a run of Boreray knitting yarn. It's the most beautiful mid-grey, and soft, way softer than you'd expect a blend of two primitive rare sheep's wools (and yet, as I explore sheep breeds, I keep saying that - why do I always expect rare breeds to be rough and scratchy? Just because they're not merino?). I have no idea what I will make with it - I have to find a perfect pattern. For now I'm more than content with having it as a pet skein to keep and cherish for a while.